All I’m seeing are the Irish national colors for some reason… green, white, and a variation of gold. But that’s not helping! Susan — and the carpet is cream with “confetti” speckles. I think it is the lighting that makes it look gold. Caryl — and yet you came up with the correct answer! 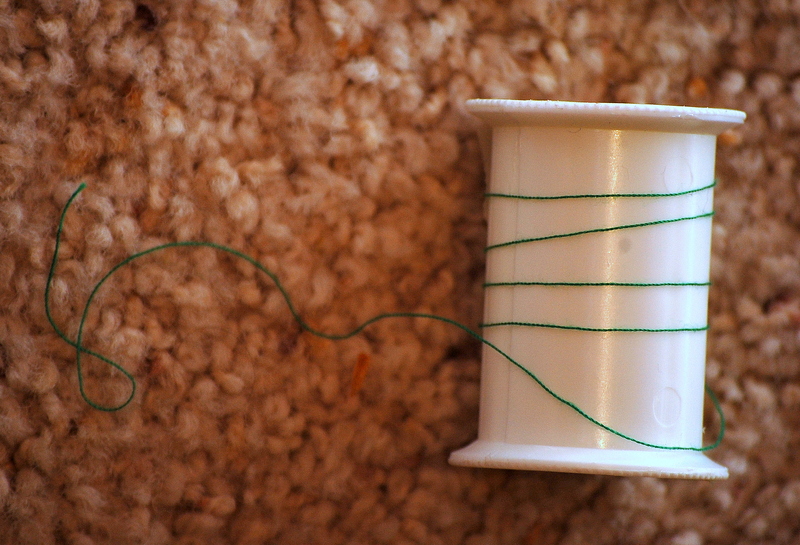 Add “green thread” to your shopping list, q!! Ouch! What a brain teaser on Monday. You are so good at this. Rosidah — some days I am better than others. Kelley — you never think you’ve got it but you often make the winner’s list. I havent’ got a clue and we are going to leave it like this. Bill — you sound a little unraveled. I was thinking I’ll never have a chance to win in the summer because I don’t get on the computer as early, but that doesn’t even matter today. Puzzling. Linda – -if it’s puzzling you then it’s doing it’s job! I looked made a guess, then i knew it was not right but, I can’t think of another. Betty — I am always happy to have you play along. I am sending you a guess. I know it’s not right, but I did make myself laugh. Nessa — laughter is what it’s all about. Raven — baggled — the term for muggling the homeless. Well that was worth staying up until 3am for…. Susan — hey, you won! Who cares about puffy read eyes? Mar – -fun and educational — what a great blog I run! Karen — no. It isn’t about the book, but nice try. Kelley — that is how it goes. Yea… that one WAS hard! Congrats to those who got it! Melli — I’ll have you know that was 100% cotton thread and very soft! Rosidah — I’m helping improve your English! Thanks, Doug. Amoeba came up with Unseamly. The other two were mine.